Williamstown is a residential suburb 8 km in a direct line south-west of central Melbourne. It is on Hobsons Bay, in the north of Port Phillip Bay. In September 1836, Sydney's Governor Richard Bourke sent Captain William Lonsdale to the Port Phillip district, thereby acknowledging that settlement beyond the permitted boundaries had occurred. Lonsdale selected Gellibrand Point at the north-west of Port Phillip Bay as the place for the official settlement, but the better situated Melbourne overtook it in his later estimation. Nevertheless a town was surveyed and named William's Town (after King William IV), on 10 April 1837. Land in Nelson Place, Williamstown, was sold two months later. Nelson Place was the main thoroughfare around the port where a stone, convict-built jetty (1838) was located. William's Town's pre-gold rush role in Port Phillip was farming and maritime activities. It was Melbourne's port, with ship mooring and repair facilities. 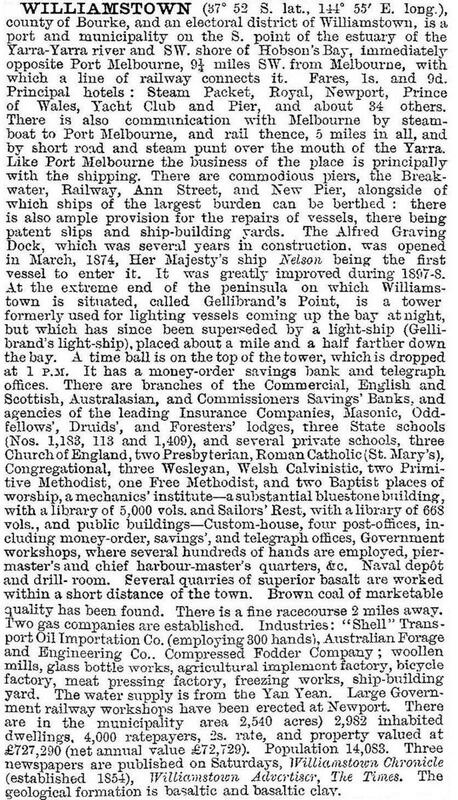 The time ball tower at Gellibrand Point (1852) was for the synchronisation of ships' chronometers, and the Naval Dock Yards and Hobsons Bay dredges were installed in the 1850s. Whilst Williamstown was important for immigrants for gold rush Victoria there is little remaining from that period or earlier. Two cottages, at 11 and 12 Cox’s Garden, are believed to date from 1851-53 and to have prefabricated materials. The impressive range of heritage buildings dates from succeeding decades. By the mid-1850s efficient land transport between Williamstown and Melbourne was needed. The West Melbourne swamplands entrapped ordinary vehicles and a railway on raised ballast was opened in 1859. Coastal defence was also a concern and a gunnery was built at Point Gellibrand (1855). At the end of the decade civic amenities arrived: botanic gardens, mechanics’ institute and post office, in 1860. The popularity of Australian Rules football led to the formation of the Williamstown Football Club in 1864, on a recreation reserve facing southerly winds at Gellibrand Point, next to the military reserve. Williamstown was declared a municipal borough in 1856 and a municipal town in 1886. City status was granted in 1919 (see entry on Williamstown city). In the 1870s the established churches constructed large places of worship, lasting until the present day: Congregational, Anglican, Presbyterian, Catholic and Wesleyan (1870-76). West of the town, facing Hobsons Bay, the Williamstown rifle range was laid out in 1878. The construction of the Coode Canal and Victoria Dock moved shipping away from Williamstown’s piers in the 1890s. In 1913 the port was augmented with a shipbuilding yard and in 1916, bulk wheat handling facilities were installed. A complicated network of railway lines spread from the Williamstown and Williamstown Pier stations to the numerous piers. A picture theatre was opened in Ferguson Street in 1911, and in a few years time attention turned to State secondary education. Excisions were taken from the east of the rifle range reserve for a high school (1915) and a girls’ domestic arts school (1925). Williamstown Beach, with its own railway station) was a popular metropolitan destination, and a life saving club was formed in 1922. During the 1920s the outstanding Williamstown personality was John James Liston (1872-1944). Raised in Williamstown, he played with the Williamstown Football Club and was elected mayor at the age of 30. He ultimately served six terms as mayor and was influential in getting public works, reticulated electricity and a new town hall built. He endowed the J.J. Liston trophy for the best and fairest player in the Victorian Football Association. Liston was also a supporter of the Williamstown Racing Club which had its course at what is now the Altona Coastal Park. The club (1872) lost its racecourse to the armed services in 1940 and its occupation of the reserve ended when a grandstand burnt down in 1945. The Williamstown Cup and the J.J. Liston Stakes moved to the Sandown racecourse. Williamstown had 40 hotels in 1900. By the mid-twentieth century they had dwindled to 20, but the buildings survived. They often served as housing during the early postwar years. Armed services huts near the racecourse were also used for temporary housing in 1946, before being turned over to the Wiltona migrant hostel. Meanwhile returned service personnel and others fired at the rifle range targets, with a stray bullet occasionally whizzing by a fishers in dinghys in Hobsons Bay. In addition to boat builders and chandlers Williamstown had wool and textile works. There were three woollen mills at the east end of Nelson Place (later consolidated as Port Phillip Woollen Mills) and a wool scouring and carbonising works near Williamstown Beach railway station. Heavier industry was in Newport and Spotswood. In the 1960s a walk along Nelson Place encountered de-licensed and derelict buildings. The botanic gardens were elderly and sedate and government land holdings were exempt from municipal rates. Williamstown was something of a heritage time capsule, avoided by the Housing Commission (and slum reclamation programs) except for small estates in Champion Road. An historical society was founded in 1956, ushering in a trend for heritage preservation in the coming decades. By the 1970s the older parts of Williamstown were undergoing a residential renaissance, attracting people with a preference for historic renovation. Access by car across the West Gate Bridge in 1978 made Williamstown a ‘gentrifiable’ inner suburb. A population peak of 30,606 had been reached in 1961. By 1991 it was 22,100, despite the number of private dwellings having increased from 8228 to 8856. Williamstown's shoreline features remained much the same from 1900 to the present day: numerous piers and recreational sailing facilities facing the calmer waters of Hobsons Bay, the Williamstown Cricket Ground and football club on Gellibrand Point, facing Port Phillip Bay and the beach (served by Williamstown Beach Railway Station) a little to the west. The web of railway lines serving four piers and the graving dock were closed in the 1960s. By the 1930s shopping had moved from Nelson Place to Ferguson Street and Douglas Parade. By the 1990s outdoor cafes had moved into Nelson Place and row houses and flats had moved on to sites formerly occupied by cottages. Houses also moved onto the rifle range which was acquired by the Urban Land Authority in 1987. Williamstown Grammar School (1867) expanded its campus in Douglas Parade and built a second campus further west in the Werribee region. In 1989 the Williamstown dockyard was sold to Transfield Services Limited (renamed Tenix in 1997). It became Australia’s largest defence company, building then Anzac class frigates. Much of the other old industry has been dismantled; the Port Phillip Woollen Mills’ site was proposed for apartments but met with much controversy. For earlier populations, see Williamstown city entry. At the 2011 census, the median income of residents of Williamstown suburb was 34% above the Australian median.